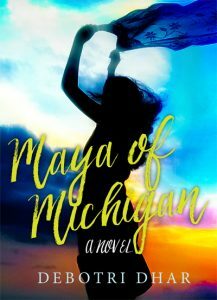 Debotri Dhar is the author of Maya of Michigan, a novel of linked stories, about an Indian woman in Ann Arbor whose story glues together those of others from America, India, and elsewhere, dead or alive, as they live, love, and travel. Fiction writer Debotri Dhar of Michigan is one of Write On’s residents this month. She is the founder of Hummingbird Global Writer’s Circle, a transnational traveling initiative to foster a love of books and idea, cultural exchange, and global understanding. She will lead a storytelling session on the theme of water on Tuesday, June 12, 5 pm, outside Norb Blei’s Coop on the Write On property. I had the opportunity to speak with Debotri about her work and upcoming residency. Maggie Peterman: What was your childhood like? Debotri Dhar: Well, I was a very serious child! My family – father, mother, and a younger sister – lived in a modest apartment close to New Delhi, in north India. As the older daughter, I saw both my parents working very hard and that, early on, instilled a strong sense of responsibility in me, to make something of myself and to give back to the world. In that sense, I was fairly focused – but there was also enough room for fairy tales, laughter, and whimsy. MP: What was your favorite class/teacher in school and why? DD: Oh, many classes/subjects across the humanities and sciences were favorites in school. I liked the languages (both classical and modern), History, Philosophy, Political Theory, and Economics. Gender issues were always of interest. For some reason, I did not like Geography in general, and maps in particular – an irony, considering I now travel around the globe! – and switched to Mathematics instead. I liked a combination of the practical and the esoteric; and those early years would become the foundation for my later interest in interdisciplinary and transdisciplinary research and scholarship. The teachers I was drawn to and inspired by, then and now, tended not only to be brilliant in their subjects but also kind, hardworking human beings who embodied both courage and compassion on a personal as well as social level. As I grew older, I was particularly inspired by individuals who encouraged us to never grow complacent, and to push our boundaries, challenges ourselves, travel, grow. MP: What after school activities did you participate in and why? MP: What is a favorite library memory? DD: In middle and high school, my favorite library memories are of taking murder mysteries home for my ailing grandfather to read. I came to the US after he died, you know. His love for me was an ocean, endless and all-encompassing. My first book was dedicated to him. As for a favorite memory from later years – that’s got to be the first time I came across one of my own books in a university library and did a little dance! You’re an author now, Debotri, I remember saying to myself! MP: What author and/or book has most influenced your own writing and why? MP: The list is long…Rabindranath Tagore, the Bengali polymath who was the first Indian (and first non-white) writer to win the Nobel prize in Literature. Edna O’Brien, the Irish writer whose literary craft and lyricism is perhaps unmatched in contemporary writing. Indian-American writers who have exquisitely portrayed the immigrant experience – Bharati Mukherjee, Jhumpa Lahiri etc. – through their real and imagined chronicles of being caught between adoptive homes and ancient homelands. That said, I do believe diasporas are increasingly becoming a thing of the past. Now each of us is a traveler in some sense or another, learning to be at home in known and strange places. MP: With a need for more diversity in literature, is there a character and author that made a difference in your life? DD: Well, we talk about how the literary canon has historically focused on the experiences of white men. Women of color have been receiving their due of late, but I’ve always felt that they get culturally stereotyped as writers and characters. Growing up, I wanted to read about Indian women who travel on their own terms, whose relationships to those of other genders, races, and cultures are of equals rather than of the colonized-colonizer. My collection of short stories, my recent novel The Courtesans of Karim Street, and my new novel forthcoming this year are all about strong female characters like that, who straddle multiple worlds, languages, identities. I write the stories that make a difference in my life. MP: What project are you currently working on? DD: So I’ve just completed a novel of linked stories about an Indian woman who falls in love with an American man – that bit is autobiographical, as I just got engaged! Her narrative glues together stories of numerous others from India, America, and elsewhere who live, love, and travel. In a broad sense, it is a reflection on boundaries – geographical, political, emotional, spiritual – and on the idea of home, and love. It’s being published by Harvard Square Editions. I’m also curating and editing The Best Asian Short Stories 2018 for Kitaab, Singapore, a publishing house that is doing good work globally to promote Asian writing in English. I also have a curated and edited collection of scholarly essays on love being published by Speaking Tiger this year in New Delhi. It’s been a busy year! MP: What is your daily writing discipline? DD: I have to juggle creative writing with my regular work – teaching and research – as an academic. So the university’s schedule dictates my own, especially from September to April. During those months, I most write late evenings and over weekends. It is only during the summer months of May to August that I’m able to devote myself more fully to literary and creative pursuits, and to exploring new idioms and ideas. MP: What advice can you give to aspiring Write On writers? DD: Giving advice can be a dangerous business! Nevertheless, three simple tips: firstly, to have faith in oneself, especially when faced with rejections, which can be quite a staple of the writing life. Second, to never shy away from learning and improving one’s craft. Third, to finish what you start. Thereafter, every writer’s situation is unique. For instance, those who need to earn a living and support a family face a set of challenges that are very different from those who write from a space of privilege and/or are not the primary breadwinners. A literary culture relying on the free labor of writers ends up further privileging the already privileged. While writers tend not to be the most materialistic of people, and most of us do our best to contribute to the community, I think it is important for writers to also insist on fair compensation for their work. MP: Is there a need for an organization like Write On in Door County? DD: Oh yes. An organization like Write On in Door County creates supportive spaces, classes and programs, for writers to develop their craft, learn from mentors, and get inspired through working with peers. The writing residencies are particularly important for artists because, while many of us are quite adept at multi-tasking, we do also need some solitude in order to create. You are making an invaluable contribution to our literary landscape. MP: What book do you think every elected official should read? DD: Hmm. I’m thinking of many books…political and moral philosopher John Rawls’ A Theory of Justice, and Margaret Atwood’s The Handmaid’s Tale to remind us of the dangers of totalitarianism as well as of religious and patriarchal excess, for instance. Amartya Sen on the intersection of economics and philosophy, Alice Walker on the intersection of gender and race…I could go on. But, on a less serious note, perhaps some P.G Wodehouse, that brilliant British humorist whose work might remind our elected officials to laugh a little. We really need more humor in public life.